Upon waking up one morning last week, I read two text messages each from my mother Kalugidan and younger brother Dagiw-a informing me about the death of Mr. Kent Sinkey. On that very morning, Mrs. Alma Bagano, who once worked with Mr. Sinkey, posted further details of the sad news on Facebook. Two weeks ago, I was on sick leave for two days so I was a bit shy trying my luck to apply for another round of leave to pay my last respect to Sir Kent. Kent was from Cincinnati, Ohio in America who adopted Sagada as his retirement residence. Together with Dr. Dennis Faustino who works with St. Mary's School of Sagada Inc. and other schools in the province, he lived in a house within the Anglican mission compound. I first met Sir Kent when I was in fourth year high school at Sagada National High School. My brother Dagiw-a was staying at their house so I had the chance to go to see him whenever my brother asked me to accompany him to. One Christmas morning, he came over to our house in Ambasing to see how we celebrate the Christian feast. According to him, he would not forget the moment on my graduation day when I approached him and said, "how about me?". He just awarded two of my classmates sophisticated calculators for their works in developing the school website. He would be in full smile whenever he reminded me of that event. Days after our classes in college started, he communicated with me asking if I could meet him in the city. He knew I was planning to apply to become a working student and I was staying at my aunt's house. He talked to me about his plans of giving me support after inquiring about my scholarship which I acquired after qualifying a state-given exam. Everytime he came to Baguio, I would see him in his room at Veniz Hotel. He taught me how to use spoon and fork while listening to all his realizations about the typical Igorot family. One evening in a restaurant, a White man went near to us and expressed his appreciation over the simple tutorial. I was totally embarassed but I did not care because I knew the food which was coming in a few minutes will cure everything. He introduced me to Google Sites and even recommended me to use Wikipedia if I know nothing about what I am researching for. He was developing websites that time- he had a successful IT career in America. We loved talking about opera (he once produced a play) and the works of British genius Andrew Lloyd Weber. We argued about politicians Barack Obama, Sarah Palin and Gloria Arroyo. When I went out with him, I would meet many of his friends. Of course, some are typical Filipinos-in-front-of-an-American-guy while others are genuinely good. Sometimes, my role was to interpret for the person he was conversing with. When I started working after graduating in college, everything has changed. He got so sickly. I am guilty of not being physically present to attend to his needs. But he knew how tough it is to look for a job, to start a career and to start living on your own. He never complained. "Good for you, you found a job. I know someone who graduated Nursing and he is still unemployed," would be his comfort words. He also had plans for me. And he tried pressing them on my depressed being. But I won. He was smart enough to understand why I was acting that way. Yet, he never complained. again. He told me, "as long as you're happy". As an American guy, he was very objective in viewing things. That is why we share some insights. The last time I saw him was last Christmas. He remembered me yet he could not identify my name. He was terribly weak and everything seems to be not okay. When I learned about his death, I was thinking he must be happy with God already. 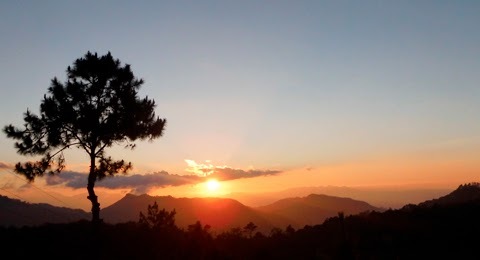 I took the last bus going to Sagada last Thursday afternoon. Upon reaching my hometown, I took dinner with my siblings then went off to Sir Kent's wake. The next day, Kent was given a mass ceremony at St. Mary the Virgin where he was baptized years ago. He was also given "Kolot" as his Igorot name. Kent was buried at the Anglican cemetery. It was with heavy heart to see someone special to go yet, we should be happy that he has left us many lessons and happy memories to exploit in facing the next day - without him.